Even though there is STILL snow in our backyard, we decided to have burgers this weekend. Not just any burgers, but homemade sliders, with homemade buns! Hilary's Mum told us about a great potato burger bun recipe from Cook's Illustrated that she uses for burgers, so we gave it a go! It's been a long time since we've made bread, but I think we are bitten with the baking bug again. We had 3 different styles of sliders. Bacon, cheddar and dill pickle. Blue cheese and caramelized onions. My favourite of the 3 was the Blue cheese and caramelized onions. Hilary also made plain burgers for Liam. When we were in the Dominican he was eating 4-6 sliders a day from the burger bar. 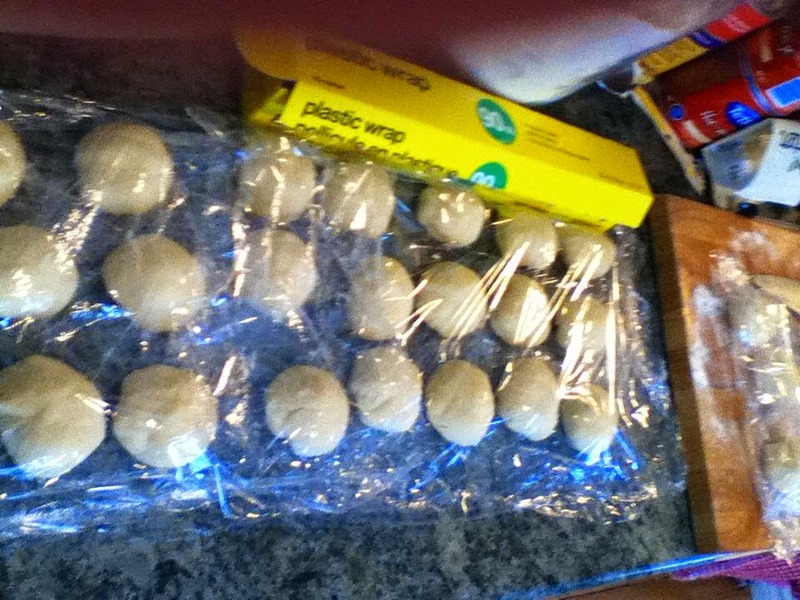 We didn't have a lot of hope that he would like them at home, but we thought we would give it a shot. He scarfed both of his down in minutes and asked if next time we would make him 4! You got it buddy! I have long struggled with the definition of "ancestor"
Webster's defines the word as "a person who was in someone's family in past times : one of the people from whom a person is descended". As an adoptee this becomes a bit of a head scratcher. Are my adoptive parent's "people" my ancestors? They are my family. But so are my birth parents, and their people. Does ancestry imply a DNA connection? Or is it a weird bit of both? There seem to be 2 types of people doing the research. Group 1 finds out some trait about one of their ancestors and immediately decides that this is why they have that same trait. "I'm musical because I share 1/100th of my DNA with someone who sang in the church choir 300 years ago" or "I'm a strong believer in human rights because my great-great-great grandfather helped out with the Underground Railroad." Group 2 doesn't attribute their own successes/failures, likes or dislikes to their long dead kin, they just think it's cool to find out the history of people. I find these shows uncomfortable to watch, mainly because of group 1. Knowing that my adoptive Great-Great-Great Grandparent did XY or Z really has no bearing on my ability to do the same thing. But I doubt it matters if my biological Great-Great-Great Grandparent could do it either. Do I get my sense of humour from genetics or being surrounded by funny people as I grew up? What makes me like animals, music, reading or anything else? Am I the product of my ancestors, or am I just only me? When I was 11, I became very interested in tracing my adoptive family tree and spent a lot of time working on a big chart, filling it out from found obits and family stories. Since my adoption was during the closed-era, I had very limited information regarding my birth family and I figured I would never be able to find out anything about them. My interest with my adoptive family's history was very much an attempt to be able to connect with the past, any past. It felt important to me at the time to be able to say that these were my people and this is where I came from. When I was 13 my mother, grandmother and I travelled to England to meet my grandmother's cousin. The trip was steeped in history, visiting gravesites and castle grounds where "our" ancestors had worked (we didn’t stumble across any long lost royalty, just a couple of gardeners). About halfway through the trip, I had a complete breakdown one night before bed. "I" had no ancestors. I didn't have any people that I came from. These stories and this history wasn't mine. One of the few things that my birth mother sent me after we were reunited was 20+ pages of her family tree. She and her daughter that she raised had worked on it together for a school project long ago. She thought that I would like to see where I came from. It was a bitter sweet gift. Finally after 30+ years of not knowing where I came from, I was holding it all in my hands. But it didn’t mean anything to me. They were just names and dates on a piece of paper, with my name and birthdate penciled in like an afterthought. I realized that I had no connection to any of these people, even if we did share our genetic makeup. 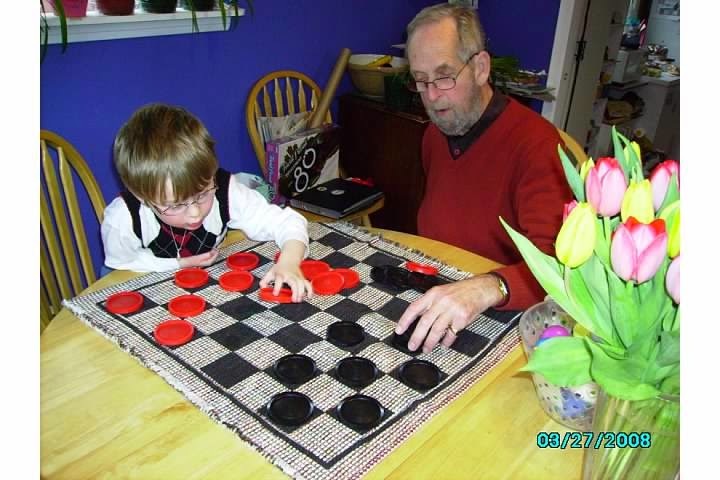 Whether you are 6 or 12 years old, checkers with Grandpa on Easter weekend is always fun!